The expedition set a speed record on the trail, and was the fourth successful completion of the trail. By 4:30AM we were on the water. A few quiet miles later we rounded Cumberland Head, just as the sun just peeking over the horizon by the lighthouse. The day was cool and sunny, and we pushed ahead, mixing big crossings with hard miles won along the shore. We weaved up through the Hero Islands to Stephanson Point, and our campsite. Twenty-two miles into a headwind on the 6th largest lake in the country, not bad for the first day back on the water. Stephanson Point State Park was just about drowned out by the floodwaters, but we found a north-facing patch a few feet out of the water to set tents and relaxed for a few hours before bed. As the sun began to set, we cooked up some dinner, and while it was a bit bland, the local flavor was not. A middle-aged carpenter and his chocolate lab Angus joined us on the beach for a about an hour. He drove his Ford Ranger pick-up throug the shallow flood waters to reach us, and, grinning beneath a white mustache and with a coozy-clad can of Gennessee Cream in hand, he regaled us with the tales of a North Hero Island local. He called the park there his “church,” a place were he came every day of the year after work “to run his dog, watch the lake, drink a beer, smoke a joint, and love life.” He also used the f-word or some derivation of it no less than 65 times during our chat. He also managaed to put away three beers. Needless to say, we were impressed. He knew every thing about the land we camped on. The cycles of the trees and the turtles, how the ice was grinding away the point every year, eventually to destroy his beloved land, and how Vermont is the best state in the country because it is the only place where it is legal to shoot fish. In fact, he was headed home to a dinner of shot pike. 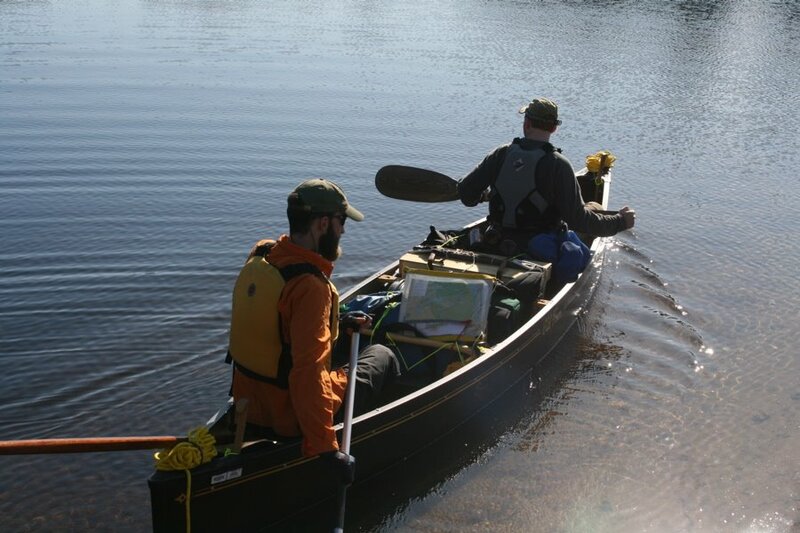 We spoke about the lake and the quifers beneath it, about the spotted turtles we would see the next day, and about the Missisquoi we would encounter the next day. Eventually, he took his leave of us and drove back across the water and down the gravel road. As we prepared to turn in, he raced back in reverse and jumped out of his truck, across the water dividing us. He got down on his knees and pulled out a harmonica. He serenaded us as his dog howled, and in that moment Ben and I both realized that we and the trip in total were going to be just fine. He bowed, returned to his truck, and raced off with Angus in hot pursuit.